Local saxophone blues legend who learned his craft at the feet of Blind Willie Witherspoon. His long-lost younger brothers are Dr. Julius Hibbert and Hibbert's long-lost twin brother, the director of the Shelbyville orphanage. His worst decision was launching into a lengthy, soulful version of "The Star-Spangled Banner" at a Springfield Isotopes game. 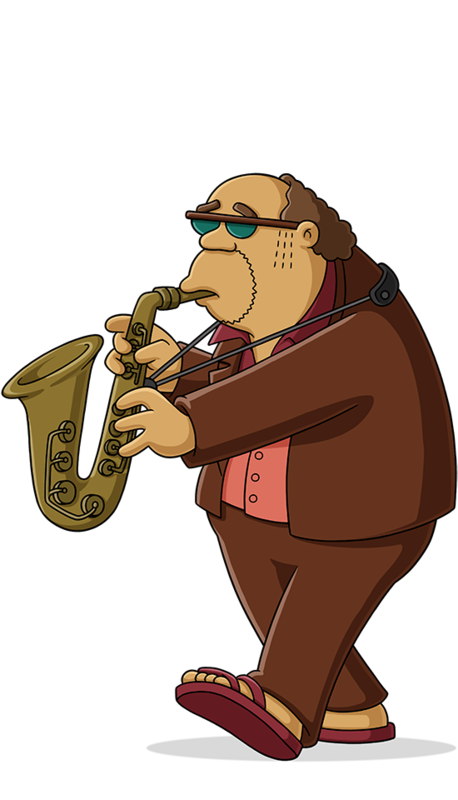 Murphy Kenneth "Bleeding Gums" Hibbert (January 7, 1936 - April 30, 1995) was idol and role model of Lisa Simpson. Guest appearance on The Cosby Show in 1986 as the Huxtable children's grandfather, as well as appearing on Steve Allen's Tonight Show. You know, you play pretty well for someone with no real problems.